Beneath the waves of the Mediterranean Sea a silent invasion is taking place, unseen by anyone above. The invaders are foreign species from all over the world, allowed transport by the hand of man. And they are here to stay. These types of incursion are far from uncommon around the world, but no place is more under threat than the Mediterranean. These foreign species follow many pathways, the most prominent being the canal of Suez, first constructed in 1869 and widened multiple times, which has allowed more than 50 fish species and hundreds of invertebrates and algae to pass from the Red Sea and Indo-Pacific into the Mediterranean. Some of these aliens are benign, doing no damage to the ecosystem or native communities. But others are not. These Invasive Alien Species (IAS) can harm native ecosystems in many ways. For one they may outcompete native species and replace them. Invasive algae may outcompete native seagrasses and change the composition and change the habitat, completely replacing the ecosystem. Invasive predators may cause trophic cascades, causing the entirety of the complex food webs to collapse. This silent and slow invasion is one of the most dangerous and destructive threats that the Mediterranean faces today and could completely change it forever. 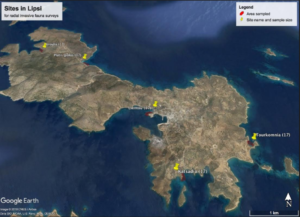 The aim of our project is to find out how many and what invasive species are present in the Aegean Sea around multiple islands. From this we can then estimate the rate at which they are spreading, the habitats and locations that are most at risk and how much of a danger they pose to native ecosystems. The information we gather can then be used to guide environmental policy to make informed actions. 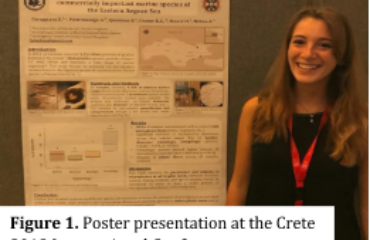 In the first part of the project we focused on invasive fish and invertebrates around the Greek island of Lipsi in the Dodecanese. Five locations were chosen on different sides of the island of Lipsi. 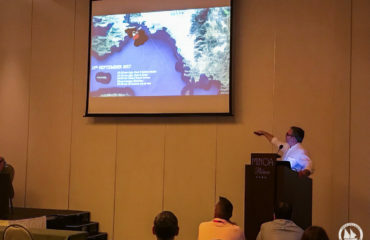 All of the sites had a mix of different seafloor types and had a depth range from about 1m to 5m, so that they could be surveyed exclusively by snorkelling and freediving. At each location 17 randomly chosen points were surveyed for fish and invertebrates within an area of about 10,000m^2. The substrate types present and other environmental data was also collected at each point. The fish survey is the first step. It is conducted from the surface while snorkelling, identifying and counting any invasive fish species within the range of visibility whilst calmly turning on the spot, so that the invasive fish within the radius of visibility are recorded. It is important to minimise movement during this step so that no fish are scared away. The second step is the invertebrate survey. For this a snorkeler has to freedive to the bottom and attach a line to a weight in the centre of the point. This line is then used to conduct circular surveys on the bottom and identify and count any invertebrates at the bottom. These circular surveys are conducted at 1m, 2m and 3m distance from the centre, which means that invasive invertebrates are recorded within a 3m radius. Lastly the substratum and other environmental data such as depth and temperature are recorded. In all of the sites varying numbers of the Dusky Spinefoot (Siganus luridus) and the Marbled Spinefoot (Siganus rivulatus) were encountered. These two species of rabbitfish of the genus Siganus have been in the Mediterranean for a long time, first recorded in 1956 (S. luridus) and 1927 (S. rivulatus). They are both herbivorous feeding mainly on benthic algae, which puts them in direct competition with the native Dreamfish (Sarpa salpa) and the Mediterranean Parrotfish (Sparisoma cretense). They could also have a large impact on the flora by their grazing. 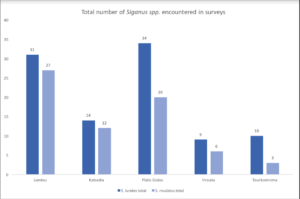 There was a higher abundance of S. luridus than S. rivulatus at every location and a large variance of numbers recorded between locations, which is suspected to be due to the habitat being more suitable and conductive to grazing in some locations than in others. 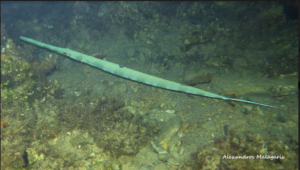 Another invader that was sometimes encountered was the Blue-Spotted Cornetfish (Fistularia commersonii). This species came through the Suez Canal rather recently in 2000, and is the fastest spreading Mediterranean invader, having reached the south coast of Spain in 2007, only seven years after it was initially discovered. 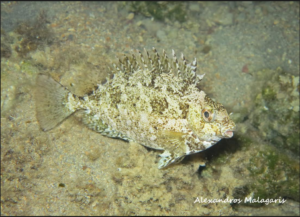 It is together with S. luridus one of the few species of fish introduced through Suez that have managed to spread to the western basin of the Mediterranean. As a rapacious piscivore its diet consists almost exclusively of small fish, especially juveniles, and more than 70% of its diet has been shown to consist of species of economic value. Therefore the damage that F. commersonii causes is not only ecological, preying on juveniles and depleting local fish populations, but also economical, for itself is considered of little to no economic value in these parts of the world. During the surveys only a few specimens have been encountered at only two locations. A reason for this might be that both of these locations are characterised by a presence of large schools of small fish (Atherina boyeri) and juveniles of other species that are known prey of F. commersonii. Conducting the surveys in Lipsi is just a first step. 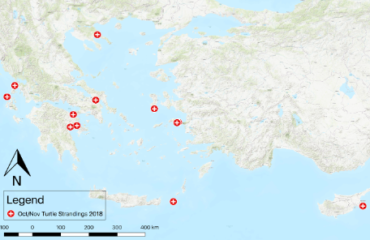 The next step is to now implement these successful methods on various other islands around the Aegean to better determine the spread of invasive alien species on a larger scale. These methods will also be used in monitoring the changes in populations and diversity of invasive species around those islands over a longer period of time, to help us better understand how our sea is changing.